If you didn't already know the kids and I are official toy testers for Orchard Toys and it's a delight to be able to work with such a lovely company. 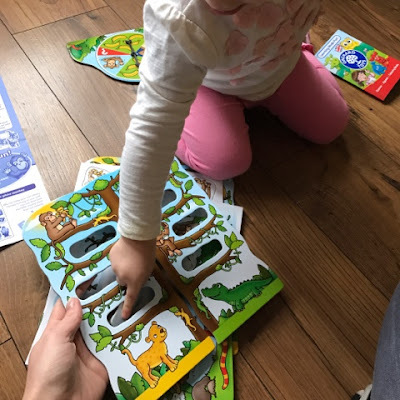 Recently Orchard Toys have launched 5 fab new games for 2017 and I was lucky enough to receive one of them for Logan and Harlow to try out. 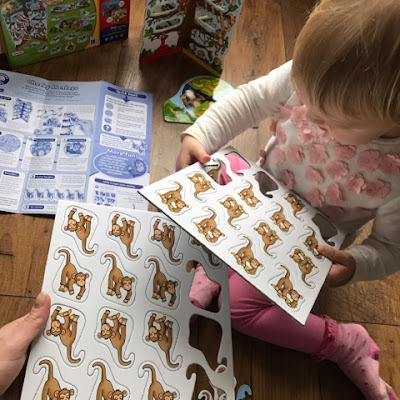 Cheeky Monkeys is a brilliant new game with a 3D element to make it more exciting for the kiddos. So what do you get in the box? Well there's a 1 two-parts 3D tree, 32 monkey cards, 1 pool board, 1 spinner board, 1 two-part plastic spinner arrow and 1 instruction leaflet. The game is really easy to set up taking us all at most 5 minutes to get ready. 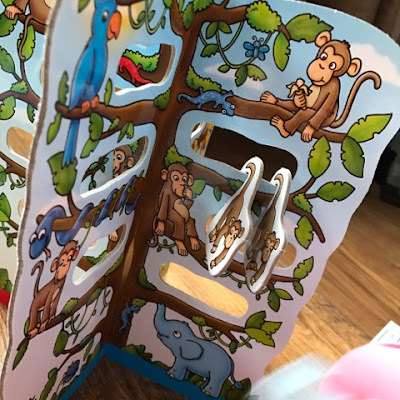 The plastic spinner arrow pops into the spinner board, the monkeys are popped out of their cardboard sheet, the 3D tree slots together nicely then all the monkey cards are spread out and turned upside down ready to start. As well as being easy to set up the game is very simple to understand so play can start immediately. It’s basically a game of chance to see which player can collect the most bananas which are on the monkey cards. So some monkeys will have no bananas or 1 banana but some might have 6 bananas! Since the cards are all facing down no one knows which is which, this makes it quite exciting for the little ones. The thrill of anticipation is brilliant to watch on their little faces. The game is aimed at 4-8 year olds and can be played by 2-4 players. You’ll see that the 3D Tree has 4 different coloured sections, you pick a colour before you start and that’s your section where you can hang your cheeky monkeys that you’ve collected. The youngest player can have the first go and the game starts with a twirl of the spinner. Landing on one of the banana sections means that you pick a monkey card and turn it over to see how many bananas it has. Some don't have any! You take the card and put it in front of you as it is now yours. The fun thing about this game is that now you can either stop and pass to the next player or you can risk another spin. If you pass then you simply hook your monkey onto your section of the tree. If you want to spin again then you keep your monkey card in front of you then see what the spinner arrow lands on. If it lands on the banana section then you do the same again and can keep doing so for as long as you like unless the spinner arrow lands on a different part. If you land on the monkey in the pool then you take any monkeys you’ve collected on your turn, sitting in front of you, and put them on the pool board. Play then passes to the next player. If you land on the monkey with his cheeky tongue sticking out you can select one monkey card from another players section of the tree and hang it on your own section. Play then passes to the next player. Last but not least if you spin and the arrow lands on the question mark (?) you have to take all of the monkeys that you’ve collected on that turn and any that are on the pool board and hook them onto your section of the tree. Then play passes to the next player. The game stops when all the monkey cards have been used and there are none left on the floor to turn over. All three of us, Logan, Harlow and I, really enjoyed this game. Logan understood the rules straight away and was buzzing with excitement to see how many bananas he could collect. Harlow being only 2, didn't quite get the rules but we managed to guide her. She did love helping us put the monkeys on the tree though. That was definitely her favourite part. 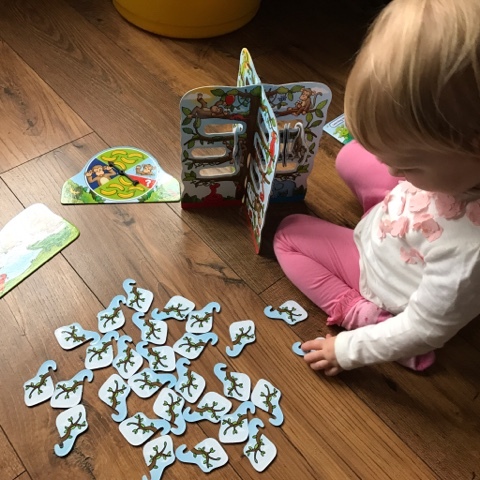 I personally like this game because it encourages your child's counting skills but it also prompts them to think of a strategy for their next move. Will they take a risk and spin again or will they play it safe with the card they've got. Life can be a bit risky at times, as we all know, so it was good to explain to Logan about the risks he would take when spinning the spinner. Overall a fantastic game and very easy to play for all the family. I don't know how they do it but Orchard Toys just keep on producing the best educational games. At £9.50 it's a brilliant price too and I'd definitely recommend to family and friends. We received this game free of charge in return for an honest review. 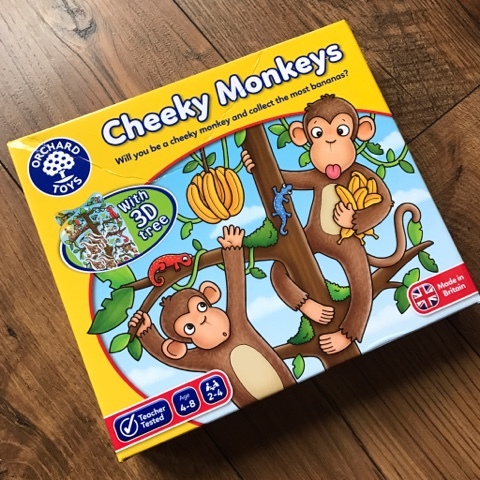 2 comments on "Review: Orchard Toys Cheeky Monkeys Game"
We love Orchard Toys games, such great quality and so much fun.